Warrnambool is a city on the south-western coast of Victoria, Australia. At June 2016, Warrnambool had an estimated urban population of 34,618. Situated on the Princes Highway, Warrnambool marks the western end of the Great Ocean Road and the southern end of the Hopkins Highway. The word Warrnambool originates from the local Indigenous Australian name for a nearby volcanic cone. It is interpreted to mean many things including land between two rivers, two swamps or ample water. A popular legend is that the first Europeans to discover Warrnambool were Cristóvão de Mendonça and his crew who surveyed the coastline nearby and were marooned near the site of the present town as early as the 16th century, based on the unverified reports of local whalers' discovery of the wreck of a mahogany ship. The ship's provenance has been variously attributed to France, China, Spain and Portugal. There is no physical evidence to suggest that it ever existed. The first documented European discovery of Warrnambool occurred under Lieutenant James Grant, a Scottish explorer who sailed the Lady Nelson along the coast in December 1800 and named several features. This exploration was followed by that of the English navigator Matthew Flinders in the Investigator, and the French explorer Nicholas Baudin, who recorded coastal landmarks, in 1802. The area was frequented by whalers early in the 19th century. The first settlers arrived in the 1840s in the Lady Bay area, which was a natural harbour. The town was surveyed in 1846 and established soon after, the Post Office opening on 1 January 1849. During the Victorian Gold Rush, Warrnambool became an important port and grew quickly in the 1850s, benefiting from the private ownership of nearby Port Fairy. It was gazetted as a municipality in 1855, and became a borough in 1863. Warrnambool was declared a town in 1883, and a city in 1918. Post Offices opened at Warrnambool South in 1937 (closed 1973), Warrnambool East in 1946, and Warrnambool North in 1947 (closed 1975). Warrnambool has an oceanic temperate climate. On average, annual rainfall is higher than in other areas of the State. During the heatwave in southeastern Australia, Warrnambool recorded a maximum temperature of 44.8 °C (112.6 °F) on 7 February 2009. The original City of Warrnambool was a 4x8 grid, with boundaries of Lava Street (north), Japan Street (east), Merri Street (south) and Henna Street (west). In the nineteenth century, it was intended that Fairy Street – with its proximity to the Warrnambool Railway Station – would be the main street of Warrnambool. However, Liebig Street has since become the main street of the central business district (CBD). The Warrnambool CBD is particularly notable for its number of roundabouts. Outside the CBD, the Warrnambool Botanic Gardens feature wide curving paths, rare trees, a lily pond with ducks, a fernery, a band rotunda, and was designed by notable landscape architect, William Guilfoyle. Wunta Fiesta, a festival held in Warrnambool over the first weekend of February annually, is one of south-west Victoria's major community festivals. It incorporates a wide range of entertainment (mostly music) for all ages. The Flagstaff Hill Maritime Museum is in Warrnambool built on Flagstaff Hill that also holds the original lighthouses and Warrnambool Garrison. Its most prized item in its collection is the Minton peacock salvaged from the Loch Ard. Flagstaff Hill Maritime Village is built around the original lighthouses and now operates as a heritage attraction and museum for the Great Ocean Road. Winner of three Victorian Tourism Awards – Tourist Attraction, it houses an extensive collection of shipwreck and maritime trade artefacts in both a museum and village setting. Baritone Robert Nicholson recorded the song Back to Warrnambool in 1924. Warrnambool is served by one daily newspaper, the Warrnambool Standard, which is owned by Fairfax Media. The local commercial radio stations are 882 3YB and 95.3 Coast FM, both owned by Ace Radio. There is also a community radio channel, 3WAY FM. Warrnambool is home to the Grand Annual Sprintcar Classic, a race which attracts Australian and international drivers on the Australia Day long weekend, especially because of its position in the motorsport calendar..
Warrnambool has a horse racing club, the Warrnambool Racing Club, which schedules around twenty race meetings a year including the Warrnambool Cup and Grand Annual Steeple three-day meeting in the first week of May. The Woodford Racing Club also holds one meeting at Warrnambool racecourse. The Grand Annual steeplechase has 33 jumps, more than any other horse race and is one of the longest steeplechases in the world. The Warrnambool Greyhound Racing Club also holds regular meetings on most Thursdays. The Greyhound version of the Warrnambool Cup is held on the first Wednesday of May. The Club also holds the Seaside Festival over the Christmas and New Year period providing great entertainment and value for money for both kids and kids at heart.. The club is located centrally in the Warrnambool Showgrounds Precinct on Koroit Street. Warrnambool is home to the Premier Speedway, a 410 metres (450 yd) dirt track oval speedway located approximately 5 km east of the town. As well as hosting various Victorian state championships, Premier Speedway has hosted Australian championships for Sprintcars, Super Sedans and Street Stocks. Premier Speedway has also regularly hosted rounds of the World Series Sprintcars, being one of only five tracks to host a round of every series run since its inception in 1987. Since 1973 the speedway has been home to the Grand Annual Sprintcar Classic, the biggest single sprint car racing meeting in Australia, and on occasion has outdrawn the famed Knoxville Nationals in the United States for number of competitors entered, as better known drivers enter both races. The Classic is traditionally run the weekend before the national title meeting. The speedway has hosted the Classic / Australian Championship double on six occasions - 1979, 1986, 1994, 1999, 2003 and 2011, with Sydney's 10 time Australian Champion Garry Rush the only driver to win the double at Warrnambool in 1986 when he won his 6th Classic and a week later his 7th national title. The mainstay of the economy is agriculture and its support industry – particularly dairy farming and associated milk processing. Other major industries and services include retail, education, health, meat processing, clothing manufacture and construction. The Fletcher Jones and Staff Pty Ltd clothing factory opened in 1948 and was closed in 2005. 15.9% of Warrnambool residents were born outside Australia, which is significantly less than the Australian average of 33.3%. 98.7% speak English at home. 1.6% regard themselves as Indigenous. The Local Government is the Warrnambool City Council. At the state level, Warrnambool was within the electoral district of Warrnambool until it was abolished in 2002. Since then, Warrnambool has been in the newly created South-West Coast electorate. This was held by Denis Napthine of the Liberal Party until he stood down, the resulting by-election elected Roma Britnell, also of the Liberal Party as his replacement. 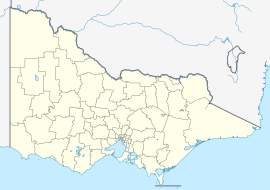 At the federal level, Warrnambool is the largest town in the division of Wannon, which has been a safe Liberal seat since 1955. However, Warrnambool booths typically receive a much stronger Labor vote than the rural areas that surround it. The seat was held by former Prime Minister Malcolm Fraser for 28 years, before being held by former Speaker of the lower house David Hawker for 27 years. The City's only university facilities are at the Deakin University Warrnambool campus. The South West Institute of TAFE and SEAL both provide vocational education. Logan's Beach on the eastern side of the city is recognised as a nursery site for the southern right whale Eubalaena australis, and many tourists have been attracted to opportunities for land-based observations. Most years one, two or three adult female whales arrive between late May and August, giving birth within days of their arrival. The young whale calf is then reared at the site, usually departing with its parent by mid to late September. Besides the southern right whale, the coastline is also visited by Australian fur seals, little penguins and common dolphins. During the winter and early spring albatross cruise along the coastline and can be sighted from Thunder Point, a popular coastal lookout in the town. Middle Island has a colony of little penguins (Eudyptula minor). Fox predation reduced numbers significantly. In 2005 only four penguins were remaining in the colony. Warrnambool City Council introduced a world first program using Maremma dogs to guard the penguins. This program has supported the re-establishment of a colony of over one-hundred penguins in 2009. By 2015 the population had reached almost two-hundred. The film Oddball tells the story of the dogs saving the penguins. Warrnambool Airport has flights operated by Sharp Airlines  to Melbourne's Essendon Airport. Rail services operate to Melbourne and Geelong. V/Line passenger train services call at Warrnambool's two stations, Warrnambool in the city and Sherwood Park in the city's outer east, seven days a week. A daily container freight service is being run by Pacific National for local container handler Westvic. Local buses under the Transit South West brand cover Warrnambool's city and suburbs and extend to the nearby towns of Port Fairy and Koroit. V/Line coaches connect Warrnambool with Mount Gambier, Ballarat, Ararat, Casterton and the Great Ocean Road to Geelong. There are two hospitals in Warrnambool: South West Healthcare, and St John of God Healthcare. ^ a b "3218.0 – Regional Population Growth, Australia, 2016: Population Estimates by Significant Urban Area, 2006 to 2016". Australian Bureau of Statistics. Australian Bureau of Statistics. 28 July 2017. Retrieved 26 October 2017. Estimated resident population, 30 June 2016. ^ "THE "MAHOGANY SHIP."". The Argus (Melbourne, Vic. : 1848–1954). Melbourne, Vic. : National Library of Australia. 12 August 1910. p. 11. Retrieved 5 January 2011. ^ Climate statistics for Australian locations. Bom.gov.au. Retrieved on 18 August 2011. ^ Race History: The First Race. Melbournetowarrnambool.com. Retrieved on 18 August 2011. ^ Boost for Melbourne to Warrnambool Cycling Classic. Legislation.vic.gov.au (12 October 2006). Retrieved on 18 August 2011. ^ AFL International Cup. Afl.com.au. Retrieved on 18 August 2011. ^ ABC News: Future of Fletcher Jones factory may be known today – 26 July 2007. ABC – Australia (26 July 2007). Retrieved on 18 August 2011. ^ a b Australian Bureau of Statistics (27 June 2017). "Warrnambool". 2016 Census QuickStats. Retrieved 3 November 2017. ^ Liptai, Tina (13 November 2008) "Puppy power is penguins' saviour". The Age. Retrieved on 15 December 2015. ^ "3AW.com.au". 3aw.com.au. Retrieved 1 April 2018. ^ Donnison, Jon (14 December 2015). "The dog that protect little penguins". BBC News. Retrieved 14 December 2015. ^ "Rail freight deal New operator avoids closure". The Warrnambool Standard. warrnambool.yourguide.com.au. 7 March 2008. Retrieved 26 June 2008. Wikimedia Commons has media related to Warrnambool. "Climate for Warrnambool". Bureau of Meteorology. Australian Government. Retrieved 24 February 2009. Warrnambool – Official state tourism site.